Greenlands Farm village is in Lancashire near Junction 35 of the M6, just south of the Lake District. We visited during our holiday at Heysham near Morecambe. The village consists of a children’s farm, and indoor soft play area, a pottery and selection of shops including a farm shop and wine shop. On Sundays there is also a car boot sale in a neighbouring field (note if visiting the farm whilst the car boot sale is on turn left to the car park on entering through the gate and don’t park in the temporary car park which shuts in the early afternoon). Unlike some children’s farms where they feel a bit too commercialised Greenlands feels like a real farm. I think that this is due to the way that it is centred around the traditional farm buildings, but also that certain elements that are in use, such as the way that it is used to train sheep dogs and the sheep shearing. I think it’s also partly because the farm is kept as a farm without any non-farm related activities. 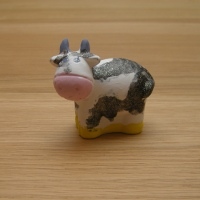 There are other things that are not farm related on the site (the pottery and soft-play etc. ), but they are outside of the farm area in the “village”. 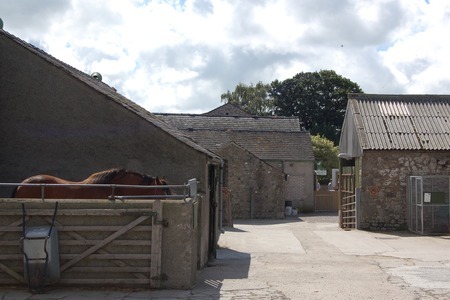 There are a good selection of animals in the farm, some of which are in the small farm buildings, some in a larger indoor barn and then in several fields. Although the fields are quite large they are positioned around a track so there is not too much walking involved. There is an area where it is possible to handle some animals such as rabbits and guinea pigs. Rather than having fixed times to handle the animals it was just a case of asking a member of staff when you saw them. There were not many members of staff around the site, but we didn’t have any problem finding someone to allow us to handle the rabbits and guinea pigs. 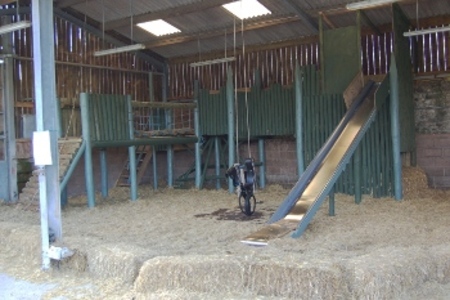 There is a good barn play area with a bridge, slide and swing built around bales of straw. There are also pedal tractors on the area outside the barn. The area outside the barn could do with resurfacing, but it wasn’t too bad and was in keeping with the general realistic feel of the farm. There are a few scheduled activities that you can watch. When we visited this included sheep shearing and a sheepdog demonstration. 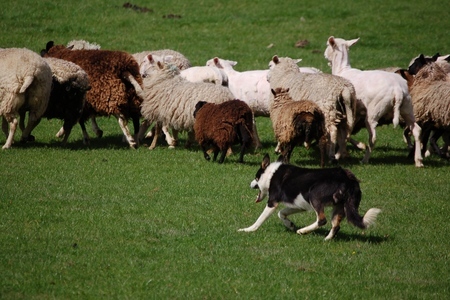 The sheepdog demonstration was good showing dogs in training rounding up the sheep in the largest field. There was also a talk about the barn owl which is a recent addition to the farm. There are also horse and cart rides available around the farm for a small additional fee. Our daughter enjoyed riding up front on the carriage. We took a picnic with us to the farm which we ate in the barn with the play area. There is a cafe in the village area just outside of the farm, but we didn’t use that. There are toilets in the open farm, but no baby changing (I assume due to space constraints), but there is a sign directing to the baby changing area just outside the farm area. 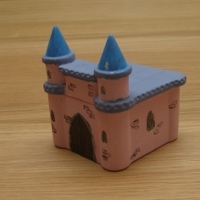 Whilst visiting the farm we noticed Wyn Abbot Pottery and was interested in the “make your own pottery” for our daughter. Unfortunately they didn’t have any clay as they were waiting on a new delivery, but we instead painted some ornaments. This worked quite well with the farm being next door as our young son had a much shorter attention span so after quickly painting the cow I took my son back in to the farm to see the real cow, whilst my wife and daughter spent longer painting the castle. There is a large indoor soft play area next to the car park. This did look good and would be especially useful if the weather had not been so nice. It is charged separately to the children’s farm. A good traditional open farm that our children really enjoyed. The Farm Village around the farm is worth a visit on it’s own with a good sized farm shop and small garden centre. This entry was posted on Monday, October 4th, 2010 and is filed under Children, Crafts, Days Out, Family, General. You can follow any responses to this entry through the RSS 2.0 feed. Both comments and pings are currently closed.